Holiday Dine in Movie Nights! Space is Limited – Sign Up Early to Reserve Your Seats! Movies will begin at 6:00pm and will be presented in the Rendezvous Fireside Dining Room. 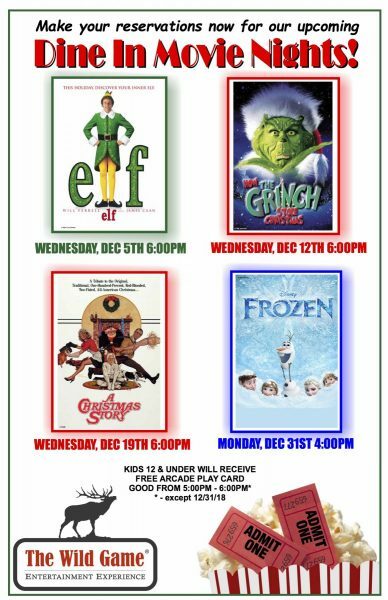 Guests are encouraged to arrive by 5:30pm to allow time to order food and drinks and enable kids 12 and under to enjoy a FREE Movie Night Wild Card good for time play in the arcade between 5:00 and 6:00pm. *- Please note that the Movie Night Wild Card can be used on all games except merchandise cranes and will not accrue redemption points.